This week involved complementary colors and the effects they have on each other. The small image just below is an example. Click on it to see a larger version - it is not easy on the eyes. At the bottom of this page are two examples of art that uses complements and split complements . Holly went through pages 23 through 26. She painted all week as described on pages 25-26. Mixing true complements to the primary colors proved to be a challenge. Make sure that your student has mixed a good complement before beginning to paint. The exercises depend on it! I must say though that mixing the perfect complement might not be possible. I am pretty sure that the colors that we had did not produce perfect complements. The student is instructed to draw on construction paper four more of the designs that are shown on page 26 (similar to the image that is linked above). Even though I have printable files that could be used, my opinion is that drawing is good practice for the art student. If you are pressed for time, you can use the handouts. There are handouts that are similar to the exercises on the web page: Exploring Color Theory. Handouts shown below are linked below in the images. Print handouts on paper that can handle paint. During Week Six my daughter painted Comparison Boxes to compare what happens to a color when it is next to its complement and when the color is next to its split complement. Later we took a week, which is not included in "The Weeks," and read about an artist each day and looked at their work. Read more here. Below are two paintings that we looked at during that week. 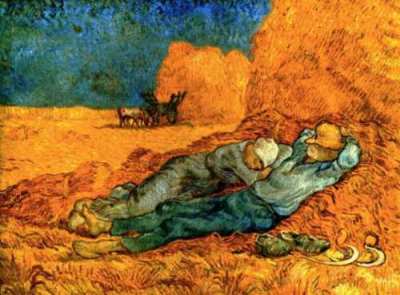 -"Examples of Color Harmonies"
This painting by Vincent Van Gogh was inspired by Jean-Franois Millet's engraving of peasants. Primarily painted with blues and oranges. 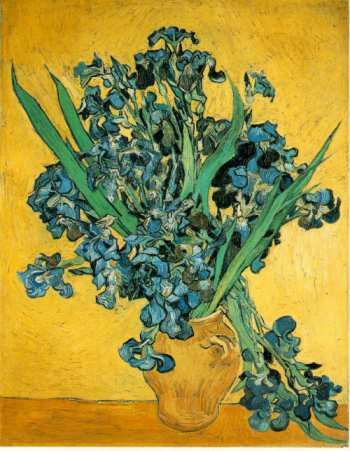 Painted with blues and yellow-oranges.